Unfortunately or not for everyone involved, many of my favorite students from years past are not in my classes this semester. I still see Roulo in the halls, and we exchange pounds, but that’s it. Same for Christopher and Tony. Elvis too. Colombia, last I heard, is in jail, as is Frankie. There’s been no sign of P-Yayo so far. 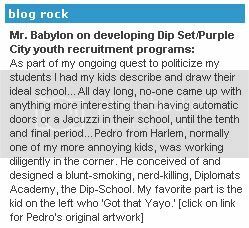 Perhaps the City finally opened up a Dipset themed mini-school. I do have the pleasure of teaching the one and only Animal Boy, Pablo Pernil, who is as charmingly scruffy and goofy as ever. Even better, I have tiny little Popsoul aka Soulrock in my class, although he seems to be regressing slightly, now channeling way more Young Buck than Hugh Masekela. He now desires to be called Soul-G, and refers to his native land of Guinea as “G-U-nie.” He’s also in my big class of 37 kids, and he’s way more advanced than any of them, so as much as it hurts, I’m probably going to recommend that he be moved to a higher level. Not to worry, though, I have a bunch of new candidates for most entertaining student status. Another likable young fellow is Kevin Soto, a big, dark-skinned kid who’s very much a gangster. I had him in a class I took over halfway through the semester last spring and he showed up twice at the most, but he was always quiet and respectful, man enough not to have to prove anything in English class. He seems to be trying to get it together this year, and has showed up every day and even did some homework. He’s all around a pleasure to have in class, but I wouldn’t be a bit surprised if one day he stood up, walked out of class, put on a pair of brass-knuckles, and donkey-punched somebody in the back of the head. We were doing group-work today--reading, answering questions, then reporting on various Katrina survivor’s stories photo-copied form the pages of People magazine--and I spent the first part of class going over the jack-booted group-work procedures. Everybody must participate and do their job. Listen to your classmates. Respect them and their ideas. Stay on task. No talk of girls. No talk of boys. No Yankees. No Daddy Yankee. Things went just fine. Some of groups took a little longer than others answering the questions though, so I put off the presentations until tomorrow. Kevin’s group was finished and were chatting quietly in Spanish. Class was almost over and it was 9th period, time to go home, so I was letting it slide. Fernando Tejada is a stylish, cocky, kid. He’s not a jerk, he just has that swinging swagger and smirking confidence of any teenage boy who’s cooler and smarter than everyone else and knows it. He was being a little difficult at first, clowning a little and showing off, but I figured out he was smart as soon as I looked at his program. I look at all the kids’ programs on the first day, ostensibly to make sure they’re in the right place, but really to kill a little time and figure out a little bit about what kind of student the kid is. If he’s a junior and in Math 2 and Living Environment, he’s probably not the studious type. If she’s a native Spanish speaker and still in Spanish 1 or 2, she’s most likely illiterate. Fernando is taking French, AP Physics, and AP Spanish. Yeah, yeah I do. Most of the time.” I gave him the short, sunny, answer. Uncanny. It’s like he’s inside my head.